A Blue School Grant last year funded a water quality project studying a school’s stormwater systems. These students are pictured completing a data sheet and sampling for the study. PALATKA, Fla., Oct. 11, 2017 — Eleven schools are receiving grant funding from the St. Johns River Water Management District’s Blue School Grant Program for projects to enhance student development in science, technology, engineering and math (STEM) related topics. More than two dozen teachers applied for funding this year and of them the top 11 projects were selected. The program offers $20,000 in financial support to teachers working to promote water resource protection through hands-on learning opportunities. 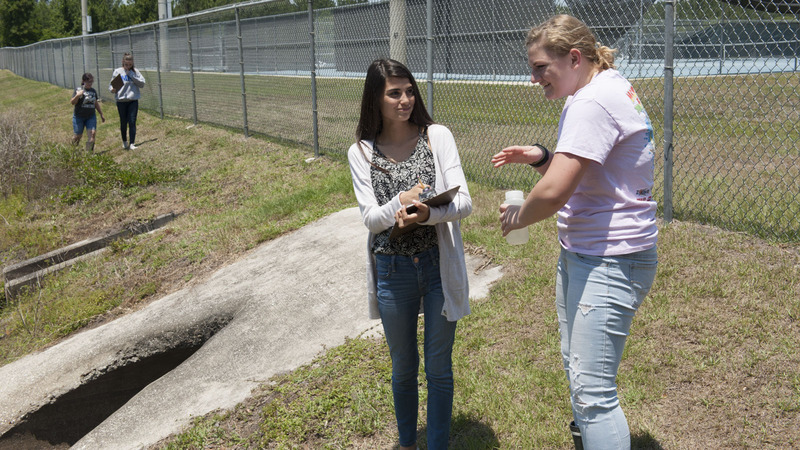 The Blue School Grant Program, now in its second year, provides grants of up to $2,000 for a range of middle school and high school educational programs to enhance student knowledge of Florida’s water resources. Projects may include water quality improvement field studies, water conservation garden projects, classroom/community awareness and freshwater resources educational programs. For more details on a particular project funded through this year’s Blue School Grant Program please reach out to the media contact listed at the top of this release. For information about Blue School grants in general, visit the district’s website at www.sjrwmd.com/education/blue-school/.